I will have a booth at Freespirit Yoga on Friday, Feb 2nd! Preorder your Valentine's grams on Etsy for pickup! I may also have some fun limited edition goodies at the booth for purchase on the day. 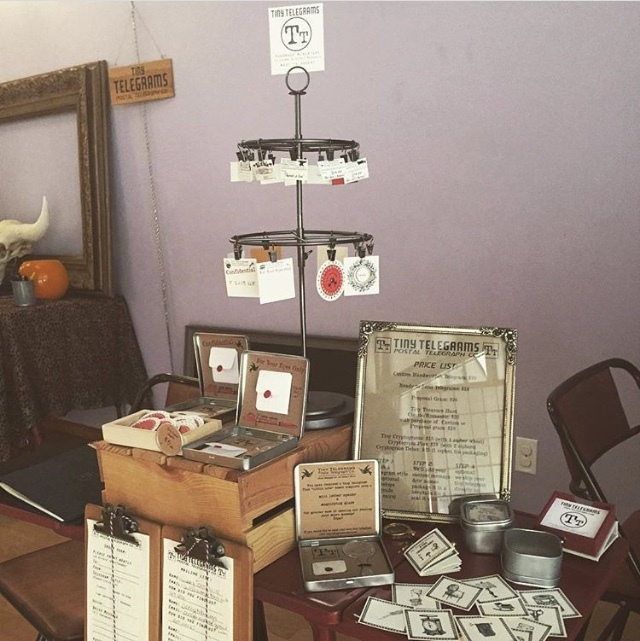 Tiny Telegrams will be back to the Downtown Long Beach Second Saturday once again! We will be taking orders from Booth 48, not far from District Wine off Linden and Broadway. Stop by for a visit! Rachel, your tiny telegrapher, also happens to teach bookbinding at Angel's Gate Cultural Center in San Pedro, CA. Please join us at AGCC for Open Studio Hours, and make a mini matchbook mini notebook or two with her in the Print Studio (Building E). Tiny Telegrams will also be available for pre-order and Tiny Treasure Hunts will be for sale. We will have square, but please be advised that Wifi may be patchy. Interested in learning Printmaking? The AGCC master Printer will also be in the studio Demonstrating printmaking techniques. You won't wanna miss the fun! For Valentine's Day, we will be vending at 1st and Linden during the Downtown Long Beach 2nd Saturdays Artwalk! Stop by and say hi!